G protein-coupled receptors (GPCRs) have a key function in regulating the function of cells due to their ability to transmit extracelullar signals. Given that the 3D structure and the functionality of most GPCRs is unknown, there is a need to construct robust classification models based on the analysis of their amino acid sequences for protein homology detection. In this paper, we describe the supervised classification of the different subtypes of class C GPCRs using support vector machines (SVMs). These models are built on different transformations of the amino acid sequences based on their physicochemical properties. Previous research using semi-supervised methods on the same data has shown the usefulness of such transformations. The obtained classification models show a robust performance, as their Matthews correlation coefficient is close to 0.91 and their prediction accuracy is close to 0.93. G protein-coupled receptors (GPCRs) have a key function in regulating the function of cells due to their ability to transmit extracelullar signals. Given that the 3D structure and the functionality of most GPCRs is unknown, there is a need to construct robust classification models based on the analysis of their amino acid sequences for protein homology detection. 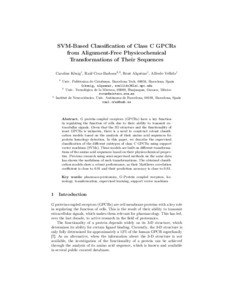 In this paper, we describe the supervised classification of the different subtypes of class C GPCRs using support vector machines (SVMs). These models are built on different transformations of the amino acid sequences based on their physicochemical properties. Previous research using semi-supervised methods on the same data has shown the usefulness of such transformations. The obtained classification models show a robust performance, as their Matthews correlation coefficient is close to 0.91 and their prediction accuracy is close to 0.93. © 2013 Springer-Verlag. König, C. [et al.]. SVM-based classification of class C GPCRs from alignment-free physicochemical transformations of their sequences. A: International Conference on Image Analysis and Processing. "New Trends in Image Analysis and Processing - ICIAP 2013". Naples: Springer Berlin Heidelberg, 2013, p. 336-343.